Product Description: Dr. Fuhrman presents the fascinating science that demonstrates how the current epidemic of adult cancers and other diseases is most closely linked to what we eat in the first quarter of life. He explains how a nutrient-rich diet increases a child’s resistance to common childhood illnesses like asthma, ear infections, and allergies. Additionally, Dr. Fuhrman illustrates how eating his nutrient-rich diet during childhood is the most powerful weapon against developing cancer, cardiovascular disease, and autoimmune disorders in the future. 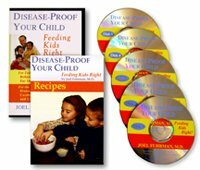 Disease-Proof Your Child, provides nutrient-rich dietary recommendations for children, and even offers guidelines and recipes that get even the pickiest eaters to enjoy healthy food.